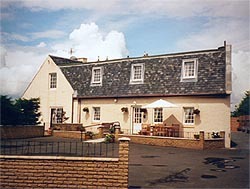 Bed and breakfast accommodation near Edinburgh. Near Dalhousie Castle, Rosslyn Chapel. Airport 15 mins. Free parking. Wi-fi broadband internet access. Carolyn and Les Davidson welcome you to their warm, relaxed and friendly family run Bed and Breakfast just outside Edinburgh, with easy access by bus or car to the city centre. The bus stop is a minute's walk away and the regular service into Edinburgh is 6 miles. Aaron Glen has its own car park so you can venture into Edinburgh without traffic or parking worries. Dalhousie Castle (romantic wedding venue) is close by and Rosslyn Chapel (of The Da Vinci Code fame) is ten minutes away by car. For those arriving by air - Edinburgh airport is only 20 minutes away - Carolyn can tell you about a good local taxi service. The guest house sleeps up to 12 and is ideal for families. 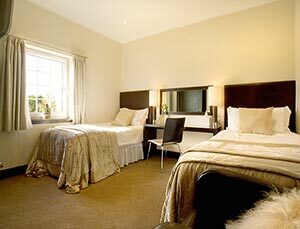 For larger parties or if you prefer self-catering accommodation, the Davidsons also have two apartments, each sleeping 4. See this related page: Aaron Glen Apartments. 5 bedrooms - including triple and family rooms - decorated in a simple, light contemporary style with modern furnishings, flat screen televisions and nice design details. Above left; Upstair bedroom with double and single beds. Above right; Downstairs double bedroom. Right; The downstairs bedroom has this walk-in wet-room/shower bathroom en suite. The black rectangle is a flat screen TV. Below left; Upstairs double bedroom. All bedrooms have tea and coffee making facilities and bottled water. Below right; Upstairs double bedroom. Local farm eggs, the best local sausages and black pudding, fresh mushrooms, tomatoes and baked beans, tattie scones locally made, and haggis - and not just any haggis - the Davidsons have tracked down the best! Fresh Colombian Coffee, tea, including Earl Grey, herbal and fruit tea. Below right; You are welcome to help yourself to the selection of drinks and mixers from the 'honesty bar'. 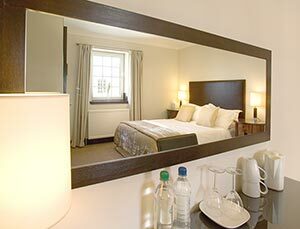 £35 - £50 per person per night, based on two people sharing. £45 - £80 for a single person. These costs vary depending on the season. 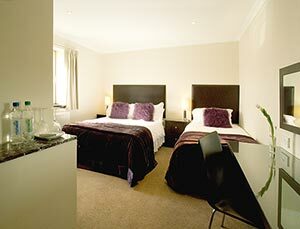 There are also triple and family rooms (please enquire for tariff). There is Wi-Fi internet broadband access for your laptop throughout Aaron Glen. Aaron Glen is totally non-smoking indoors. "This was one of the warmest and most cozy homes we have had the pleasure to stay in." Amysia Welsh and Joshua Zimmerman, USA. 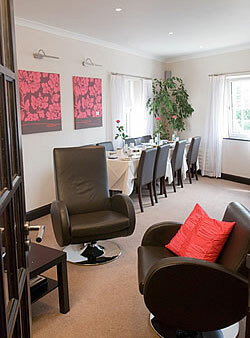 "What a wonderful B&B - comfortable, very friendly and good food. Thanks so much." Mike and Donna Harrington, DE, USA. "Good fun! Thanks!!" BMO Bunch :) Singapore. "Thank you ever so much for your hospitality. You never fail to make our visit an amazing stay. 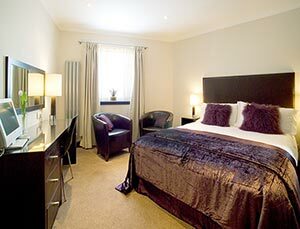 You really are the best B&B and whenever I visit Edinburgh I hope to stay at Aaron Glen." Please tell Carolyn you found Aaron Glen Guesthouse through About Scotland! sleeping 4 to 8 each.